What better than to have a ready reckoner stock impacted by any government policy!!!. We have ready to view themes pertaining to financial schemes lauded by the government. We also have themes on some socio-economic policies which can not only shape the entire economy but can also change the way the society looks today. Since the names of the schemes are in synergy to the Government policies thus it’s very easy to spot them. There are a host of themes listed under our watchlist each having its own specialised area to deal with. Each area in itself is a major threshold of an economic upturn for the Indian economy as a whole. 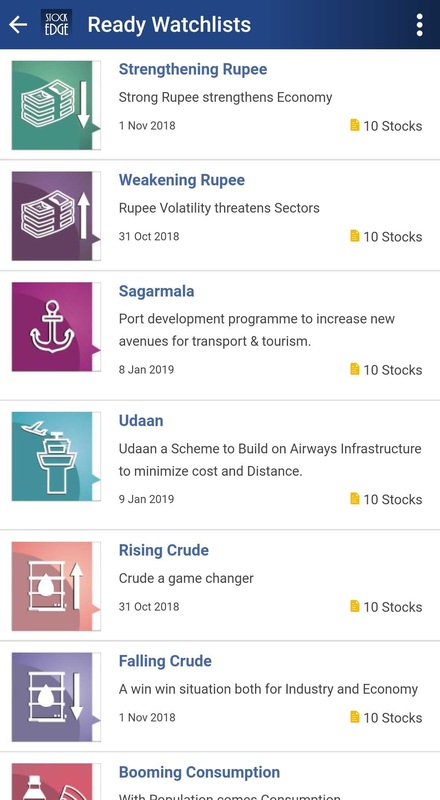 Under our premium version in Stockedge App you have all the information required under various Government norms and schemes like a story. It not only gives you a brief idea about the theme but also gives a list of stocks pertaining to each theme. Every stock has its own unique feature with synergy to the scheme it is in. 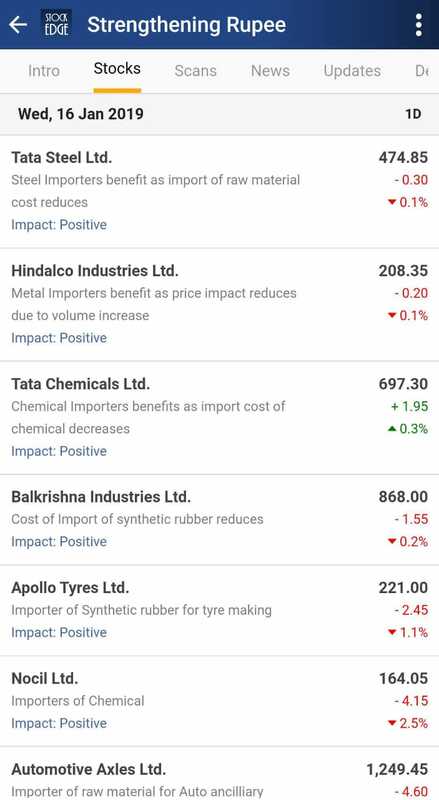 Thus every stock gets affected in a different way under the same theme. The Udaan watch list deals with increase in number of airports which will help shorten distance between two places. It will also aid in economic enhancement of the newly connected places. This will brighten the socio economic development of the place and people as a whole. The Smart City watch list deals with the government plans of building planned cities in Tier 1 and Tier 2 cities and providing them with basic infrastructure under PMAY or Pradhan Mantri Aawas Yojana scheme. This will help to raise the socio-economic standard of living of many in Tier 1 and Tier 2 cities. Any adverse or positive policy change impacting a particular theme will be in front of you within seconds at the click of a button. This feature is an added advantage with various other financial features in our app. Thus it’s a readymade stock watch list to keep track of under any government announcement. Thus any buy or sell decision with the readymade scan will help you to make informed decisions regarding your stock. Thus all in all its a win-win situation for both traders and Investors. 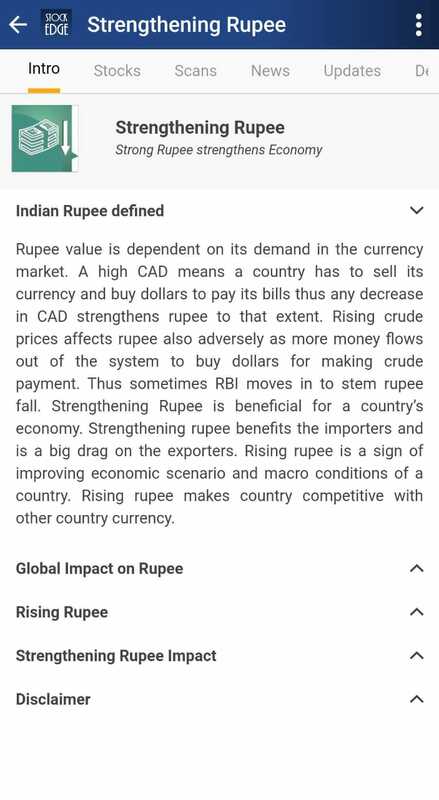 Thus be it any trading strategy or investment opportunity, Fundamental or Technical, we have it all under one App thus whichever model suits you, use it to stay ahead of others. So what are you waiting for? Subscribe to our App at the earliest and be known as a trading wizard in your group.